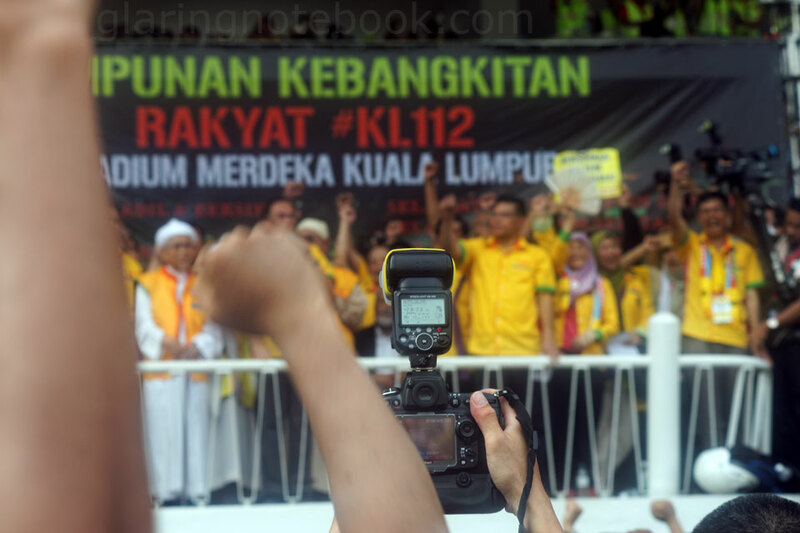 On the 12th of January 2013, I went down to Merdeka Stadium for the Himpunan Kebangkitan Rakyat, also known by its Twitter hashtag, #KL112. But first, I rewind to when I woke up late, as I wasn’t as excited for this rally because it would unashamedly have opposition parties involved, not just the more neutral movements. I only realized later that this was a combination of every big movement there was! 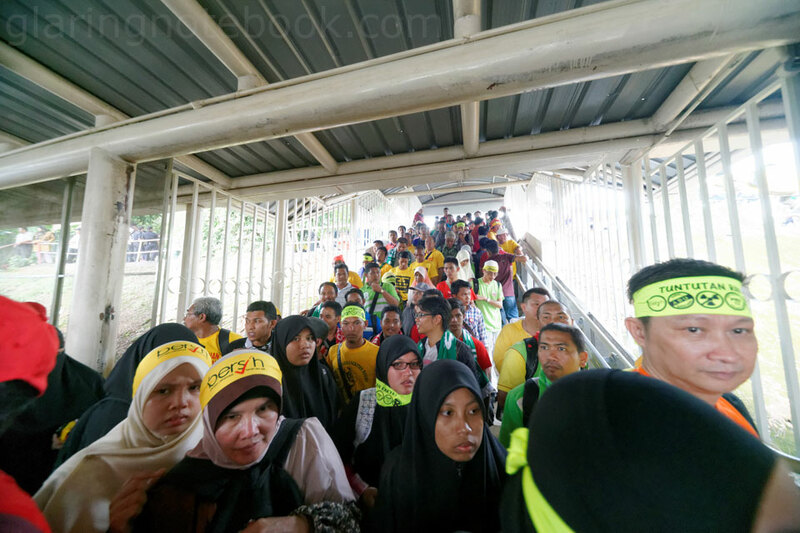 I got on the monorail at 3 something – the rally was to start at 2pm, and the processions, before that. I missed all that, which is quite the sight to see, especially from above! 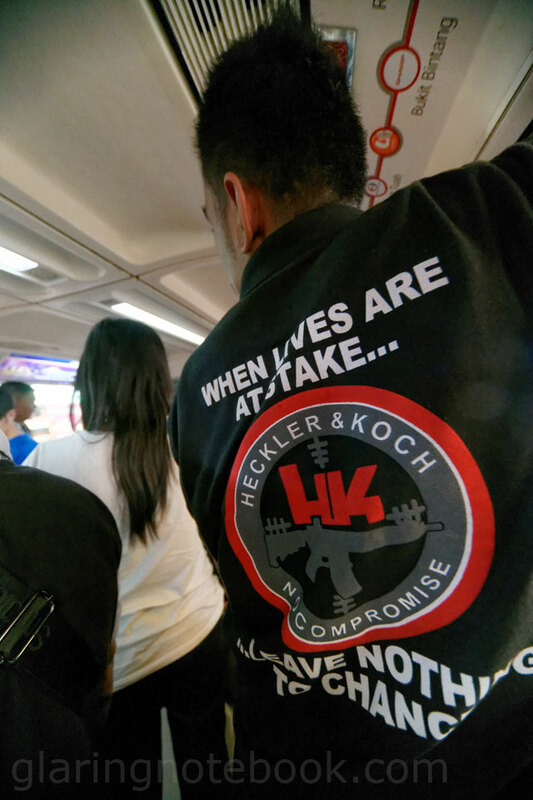 I should point out that I suspect this guy with a Heckler & Koch polo shirt is someone in the police or army. 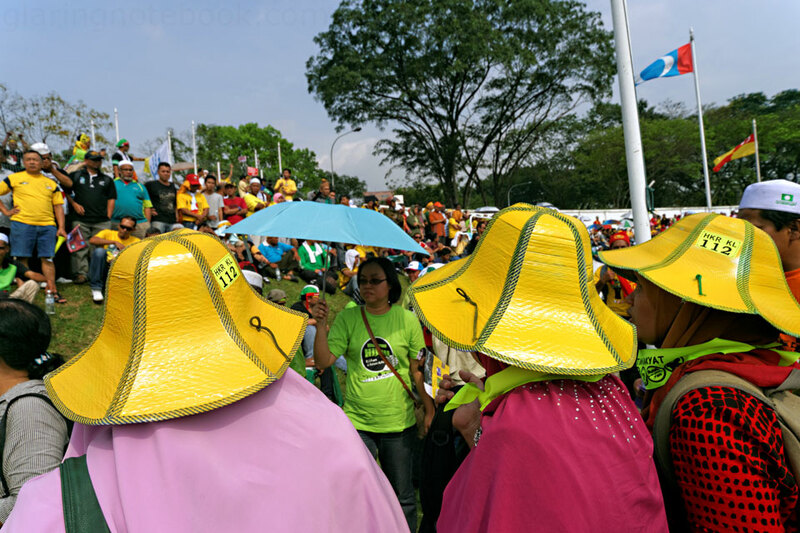 Many videos with paid protesters feature antagonists with weapon branded caps or shirts. Nevertheless, I am glad nothing happened the whole day. I brought 3 zooms that day – the Sigma 12-24mm F4.5-5.6 EX DG, the Minolta 24-50mm F4.0, and the Minolta 70-210mm F4.0 “beercan”. 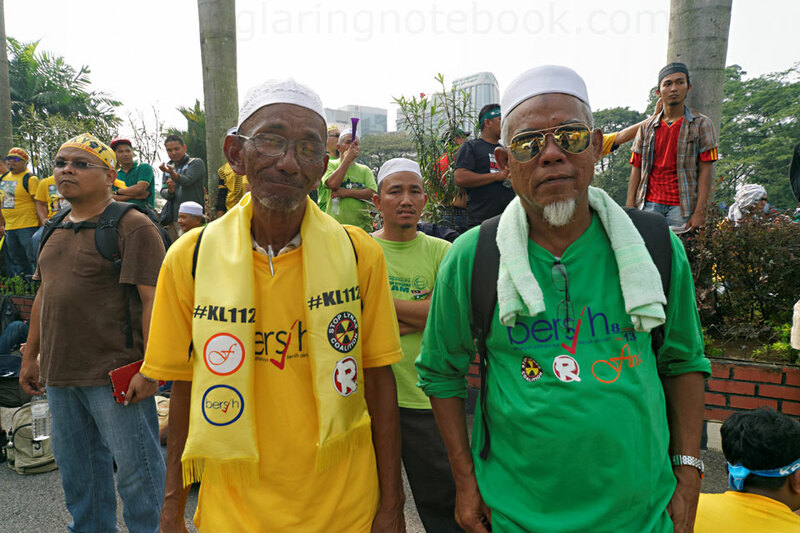 Rally-goers from the Islamist party, PAS. 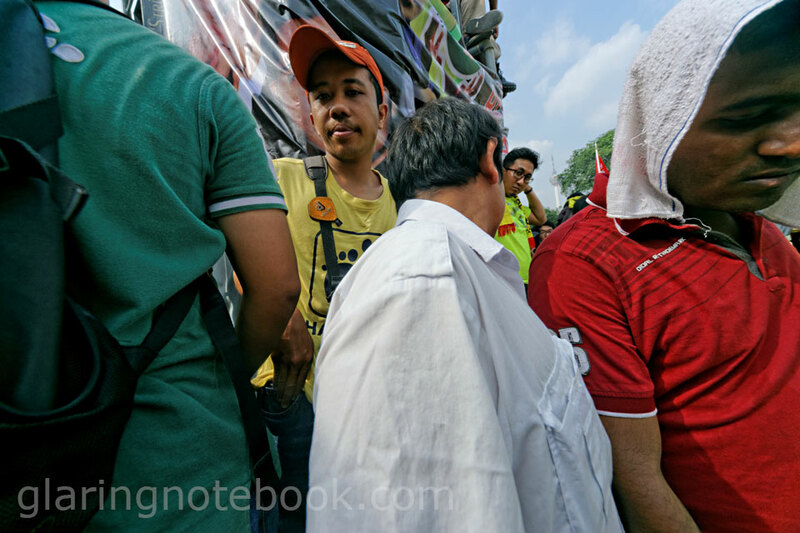 Orange shirts represented the Himpunan Oren Selamatkan FELDA protestors. 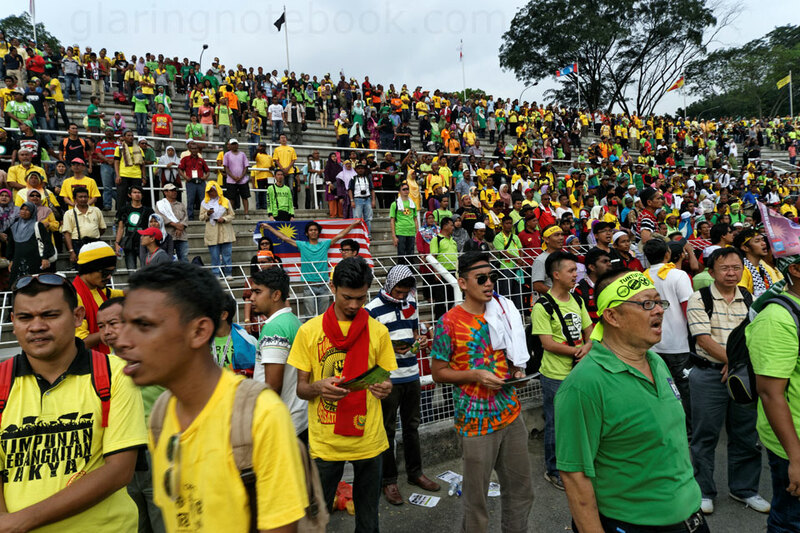 People were not too careful not to step on the face of Isa Samad, former Minister of Federal Territories and former Chief Minister of Negeri Sembilan, then found guilty of money politics. 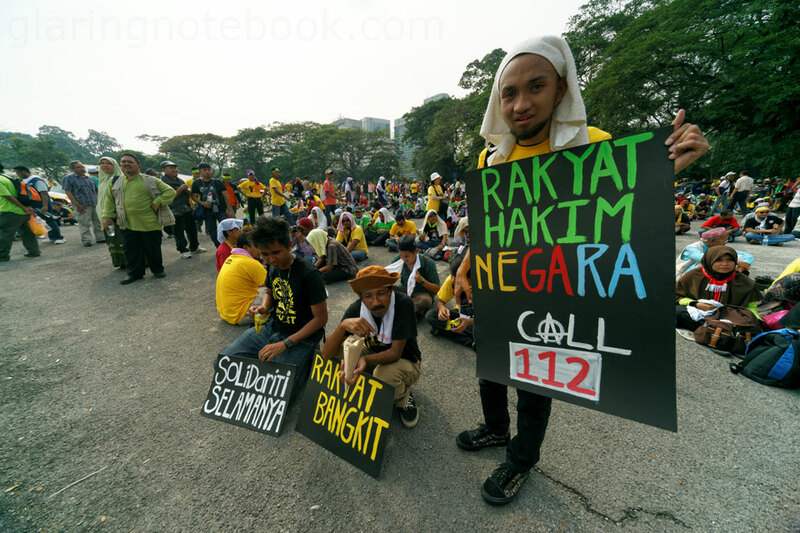 He then became chairman of FELDA, which is who they are protesting against, among other things. 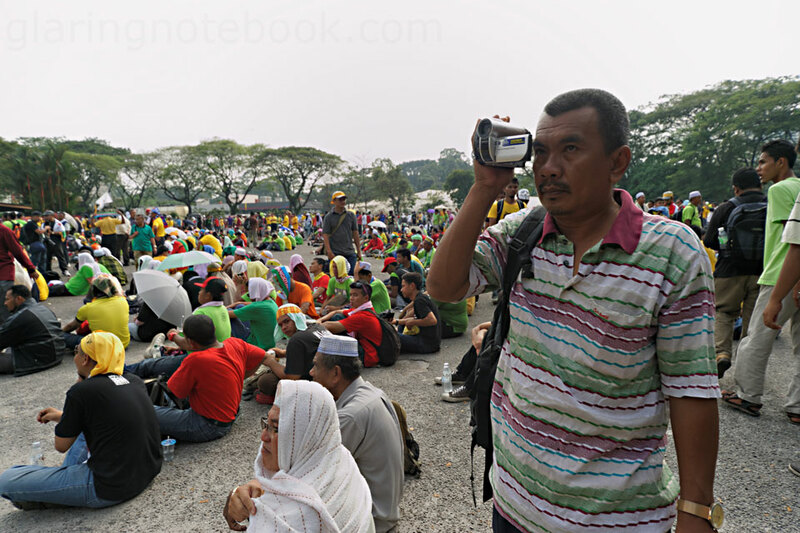 If the mass media won’t print news about the rally, people will record it. Media is perceived to be biased anyway, so why not come down and record it for yourself, to show your children, if and when these events are forgotten? 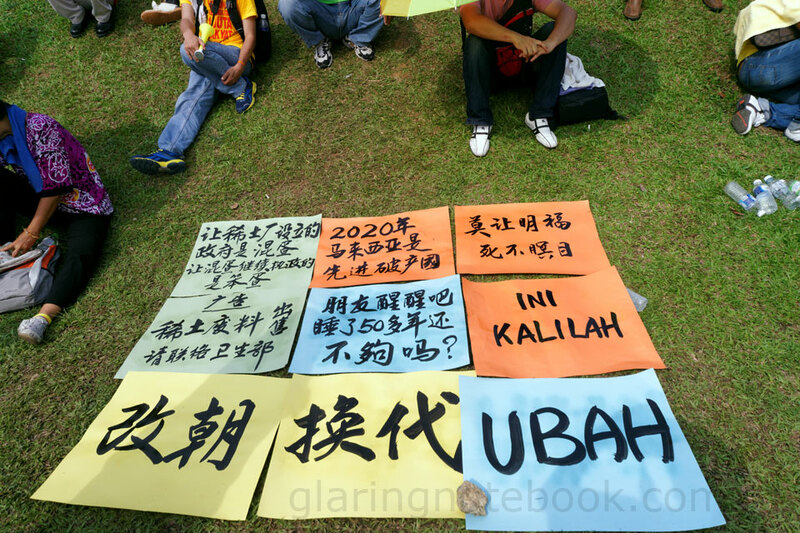 The variety of placards was a lot more than any other rally – then again, every other rally was just one or two groups maximum. Their glasses drew me to take their picture. I finally found out what the R was – it was for Royalti, to demand that the states that produce oil, get their 20% share as it is stated in the law. Their long name? Gabungan Profesional Menuntut Royalti, Pendaratan Minyak dan Gas. 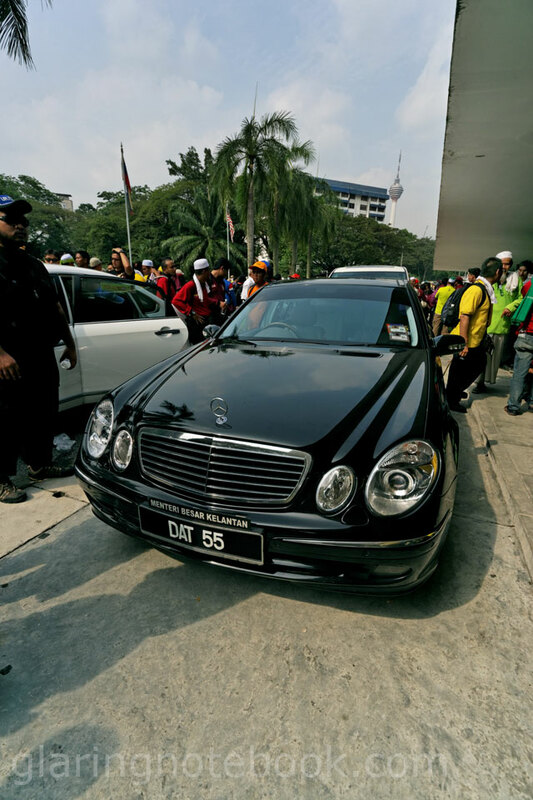 The Chief Minister of Kelantan, Dato’ Bentara Setia Haji Nik Abdul Aziz bin Nik Mat, must’ve transferred his license plate over from an old car. DAT 55! 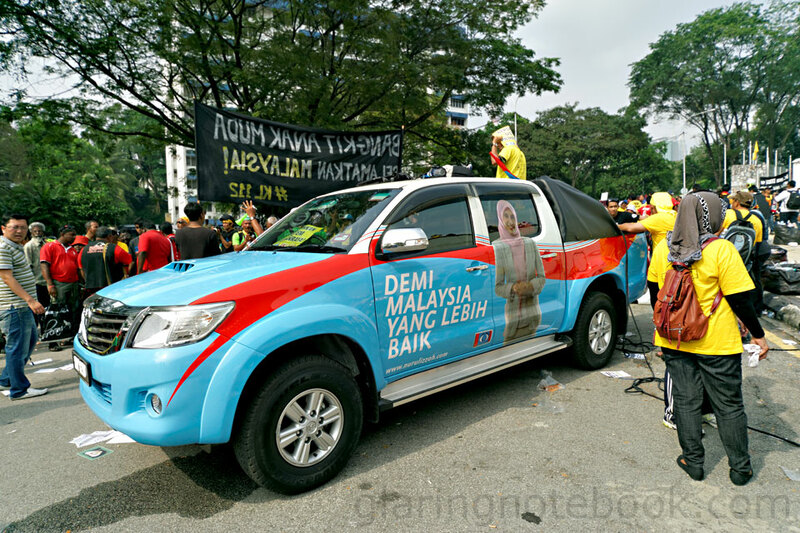 Nurul Izzah’s roving promotion vehicle. 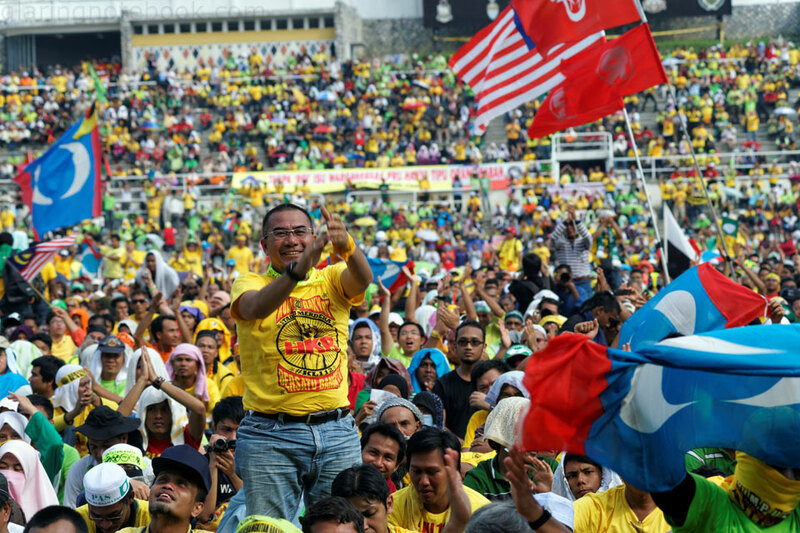 S. Arutchelvan, Secretary General of Parti Sosialis Malaysia. People were all over the walls, railings, roofs and any surface they could find, like cats. The tunnel leading to the main area. This taxi driver sure wasn’t a fan of the Teksi Rakyat 1Malaysia plan that the government conceived, that gave them 4 new tyres and encouraged them to be ambassadors to the government. Ironically, just the night before, I was in a taxi with one such young man, who had a TR1Ma bumper sticker on his front windshield. He was born in 1988 and seemed to be a bit more in tune with the younger generation as far as talking to somebody who wasn’t siding with the government was concerned. 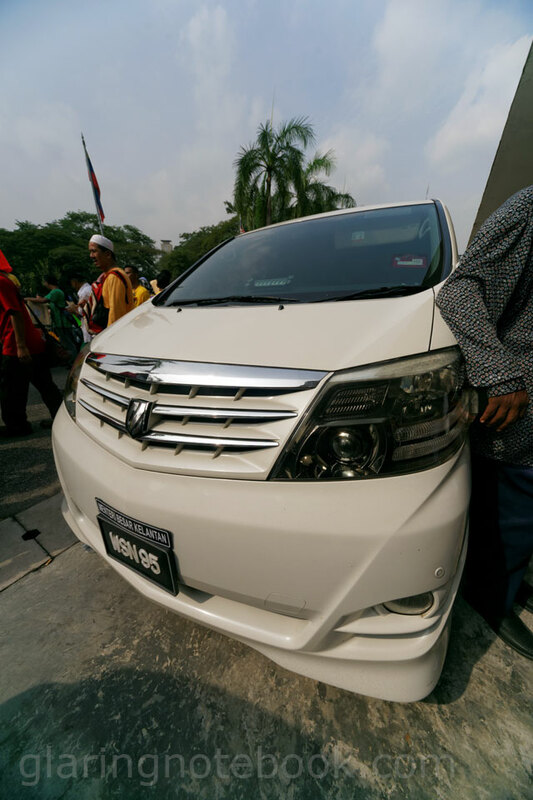 It started with him revealing that he was with JASA, in the Prime Minister’s Department. 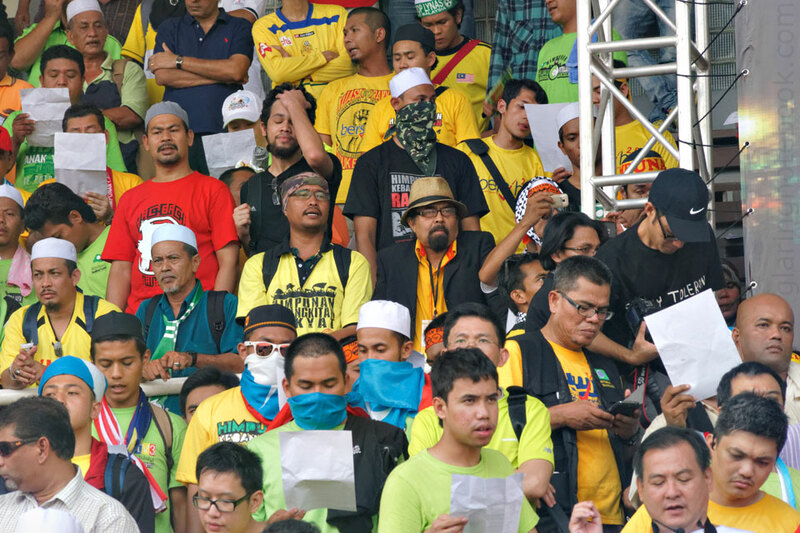 As such, he was allowed access to certain high-rise buildings to photograph rallies, but his camera was also confiscated during the BERSIH 3.0 rally. Even after we reached my neighborhood to drop me off, we continued talking for 2.5 hours! 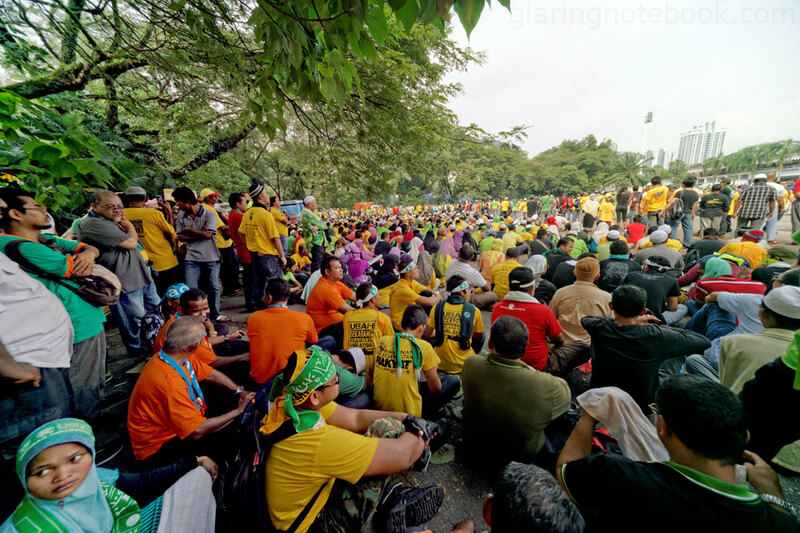 He then explained that JASA had pro-government and pro-opposition photographers, and they were not afraid to speak their mind. He admitted it was hard for the government to come up with policies to appease everyone. 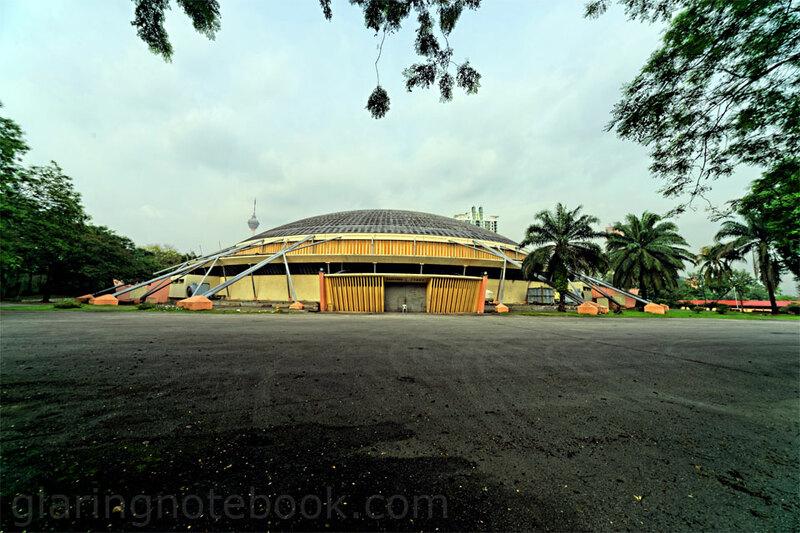 He did, however, eventually show his UMNO-bred roots – he cited an example of how it used to be that when building a road, a Malay contractor would get it to build this, a Chinese contractor would do that part, and the Indian contractor would build the road. He says this is better than the liberalised market where a foreign company can simply enter and take all the money out of the country. 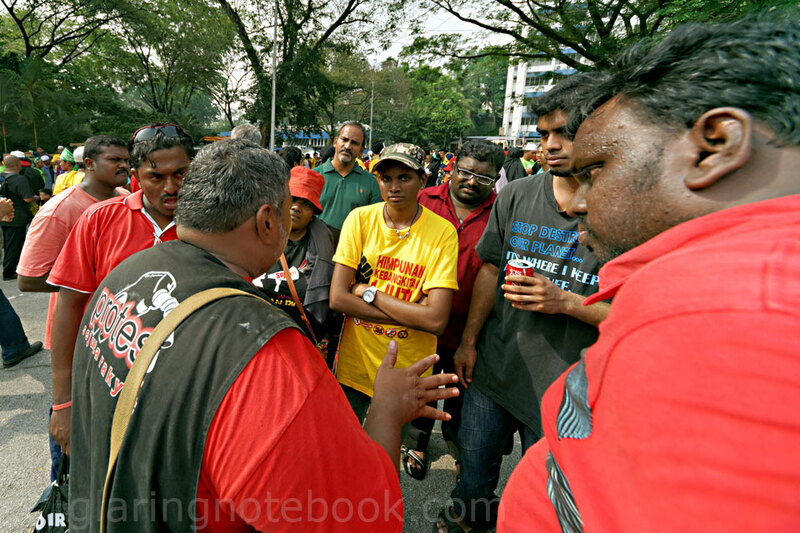 He then told a story of his uncle (if I remember correctly) that if he entered the jungle, found a snake, a Communist and an Indian, he would kill the Indian first! He also complained that the Chinese would be too calculative, whereas he gave me a 70 sen discount on the taxi fare. I then threw back one at him, how Malay traders often don’t carry enough spare change, to the point that I don’t want to eat there when I only have a RM50 note. 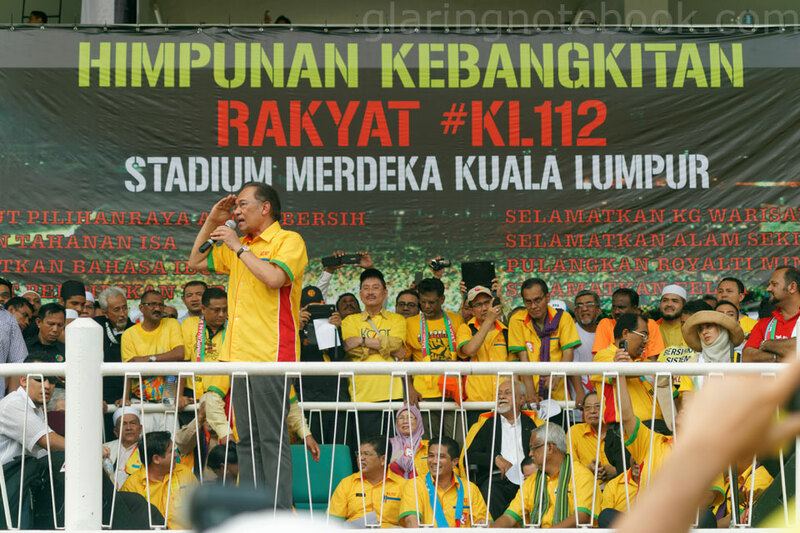 He apologized for this, and said they were trying to train Malay traders to have much more “duit float” (spare change). 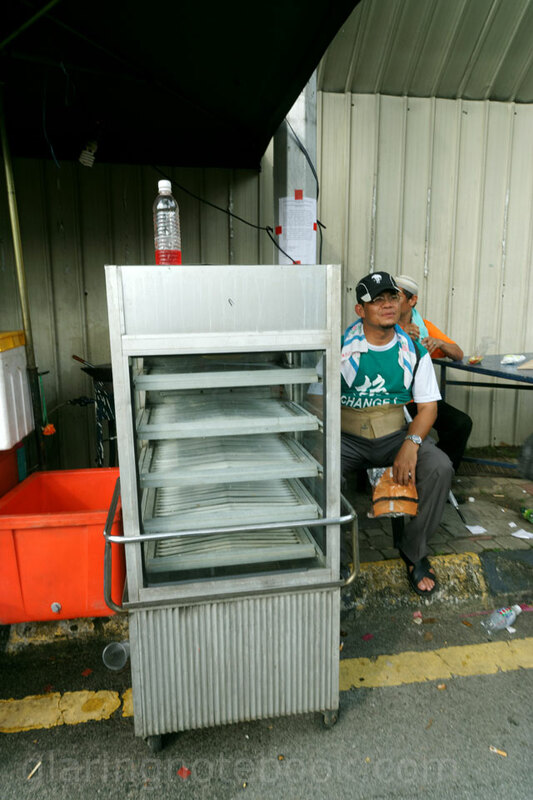 He also recounted a story of a Chinese sugar cane-selling lady who sold her drinks at 80 sen. 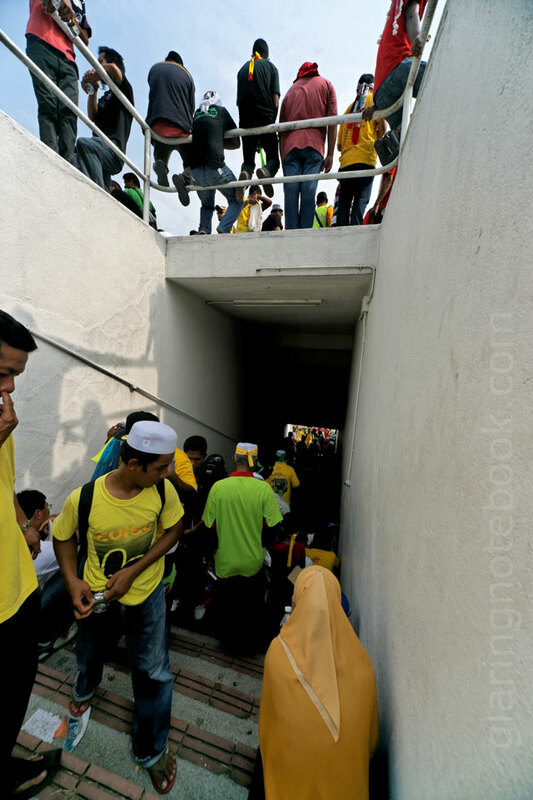 He asked, “how do you keep in business when you don’t charge so much?” She said, “as long as you’re not losing money, you’re doing alright.” He contrasted this to the Malay mentality, that they must have profit, or else they quit and change business. This also explained why you’d see a restaurant with excellent currypuffs or the best nasi lemak ever, disappear without a trace, despite seemingly good business! The consistency is what brings me back to a place, and I am disappointed when a stall decides to disappear whenever they like. Chinese stalls certainly don’t do that often, plus they would be ashamed of themselves if they didn’t have change. He then defended the Election Commission’s reason for not dividing the constituencies properly – if they did, there would be a lot more Chinese-majority seats. 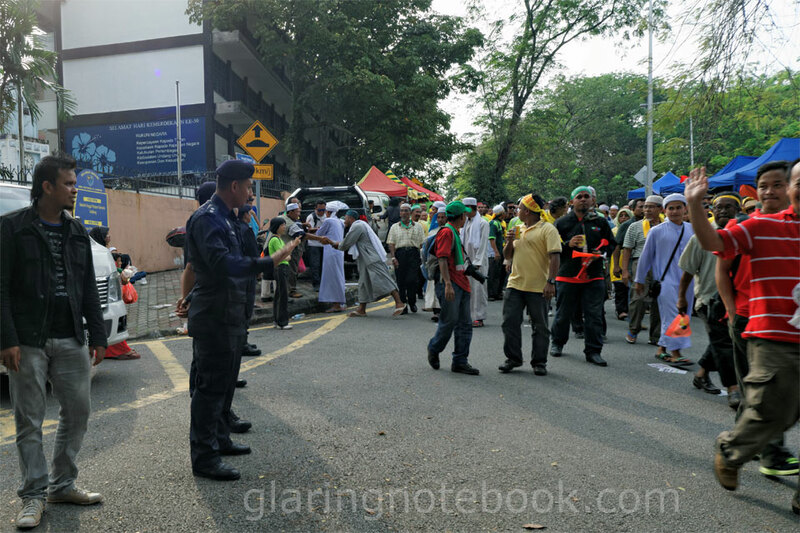 “If you are Malay, you would make sure your fellow Malays are well-protected and can survive.” So what, I asked him? 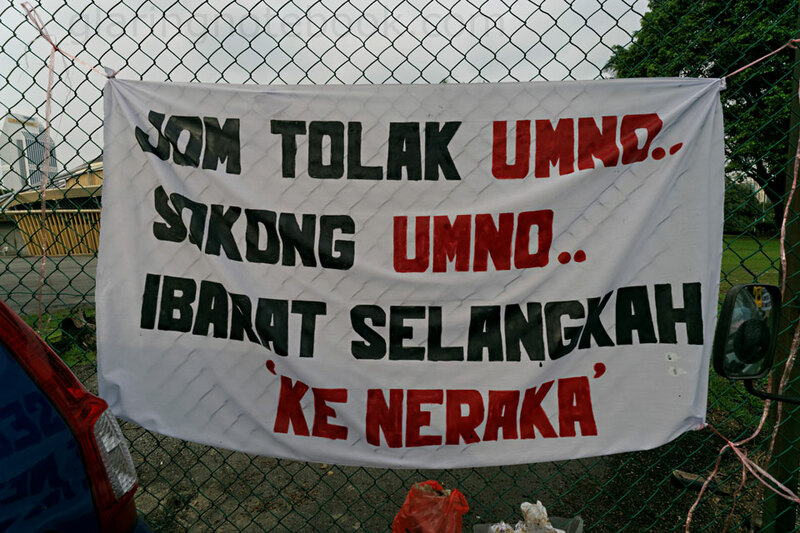 I told him I was all for meritocracy, but he was still a product of UMNO. I definitely cannot say I am not racist at all, but this guy put it in perspective. You know which side you stand on when you find someone far more racist than you. In retrospect, I might’ve had the honor of meeting one of their better cybertroopers. He was previously selling mobile topups, and he now does freelance photography and drives a taxi. I respect that he used the meter, but I hope he realizes that we aren’t in the best economic situation if we have to take on two or more jobs to survive! 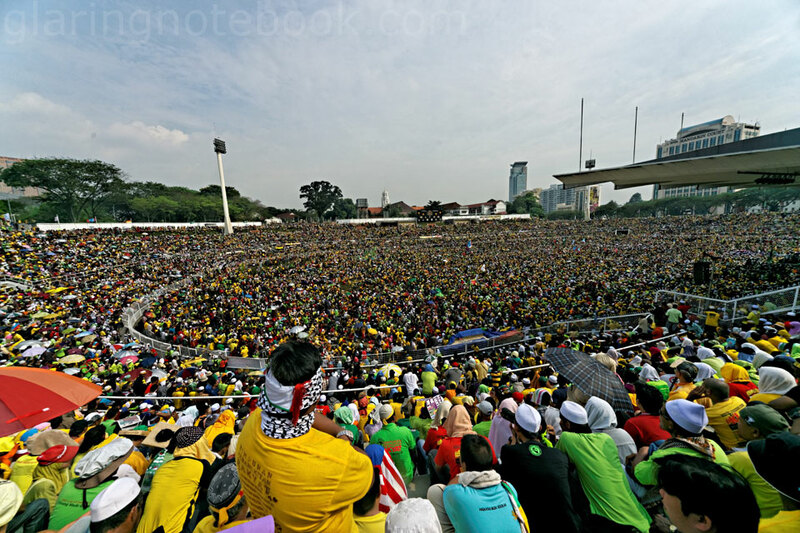 So yeah, the massive crowd! Click the picture for the full-resolution version. The toilets, and again, people on the roof like cats. I don’t know what it says. It’s a picture like this that makes me love my Sony Alpha 99 – I pulled out a beautiful amount of dynamic range from this photo! I was trying to go for a Konica or Fujifilm Superia look. 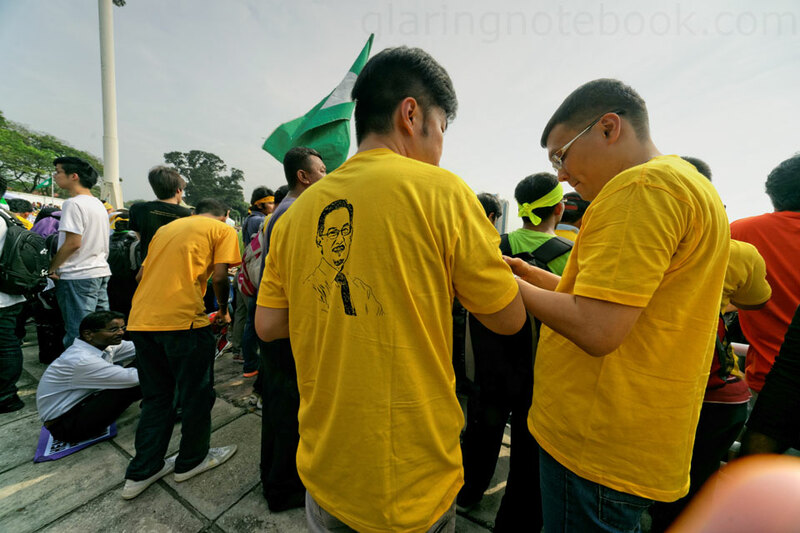 First time I saw Dato’ Seri Anwar Ibrahim on a shirt. Another view. Click the picture for the full-resolution version. Stairway going in to the field. Banners of all sorts. 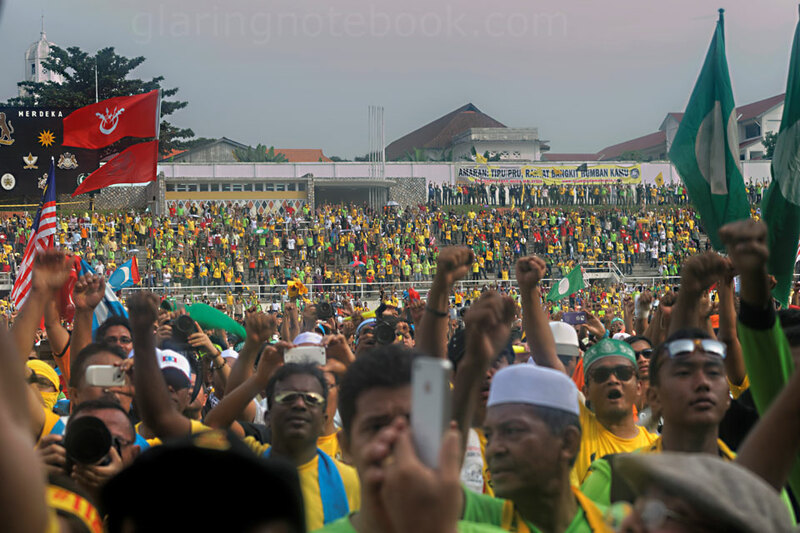 The amount of colored fists shows you what a mish-mash this gathering was! 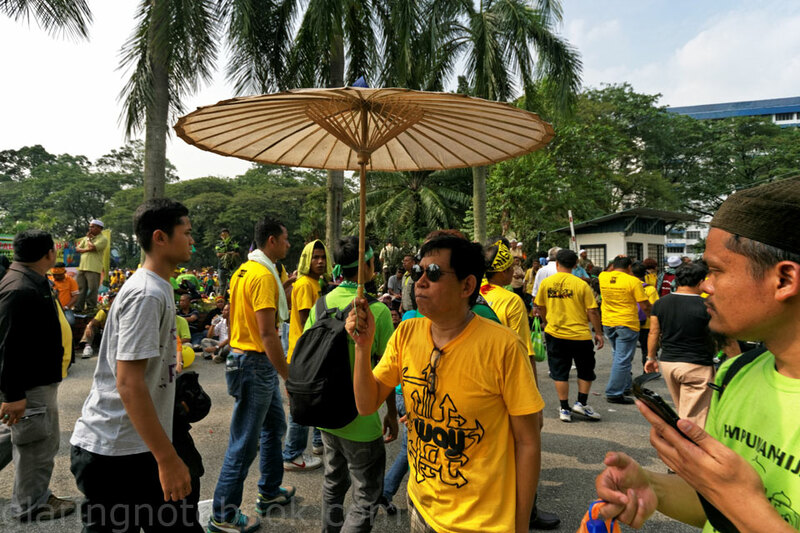 – Yellow for BERSIH 2.0, itself a coalition of many NGOs for free and fair elections, different from BERSIH (1) that had political parties, BERSIH 2.0’s committee is non-partisan. 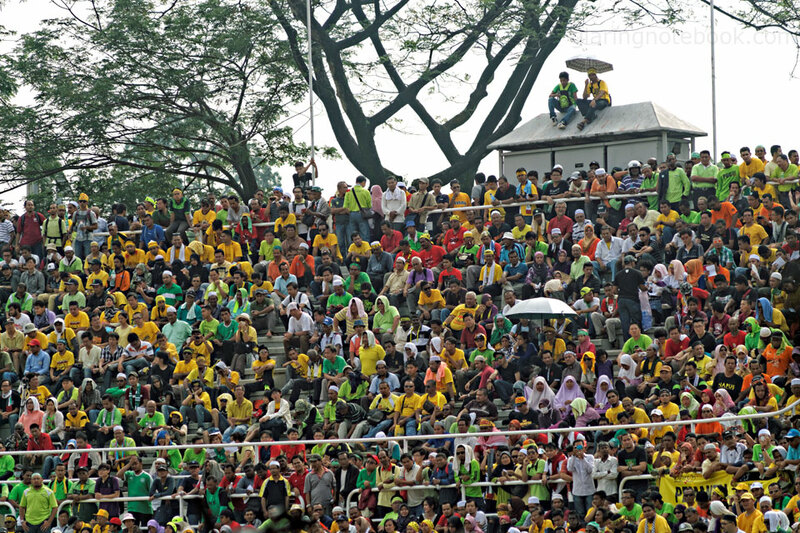 – Green for Himpunan Hijau, who are against the Lynas LAMP rare-earth refinery in Gebeng, Kuantan. – Red for Gerakan Mansuhkan ISA, who are against the Internal Security Act, which allows the Home Minister to arrest anybody without trial. The ISA has since been repealed, but there are still prisoners under the ISA! 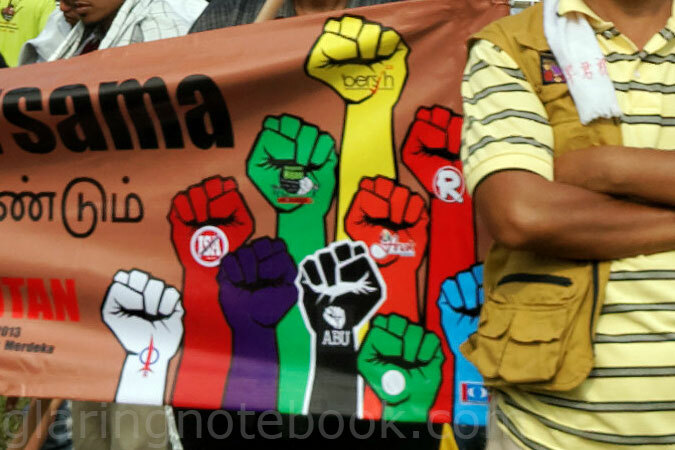 – Black for Asalkan Bukan UMNO, a movement against UMNO, the primary party of the current government coalition, the Barisan Nasional. 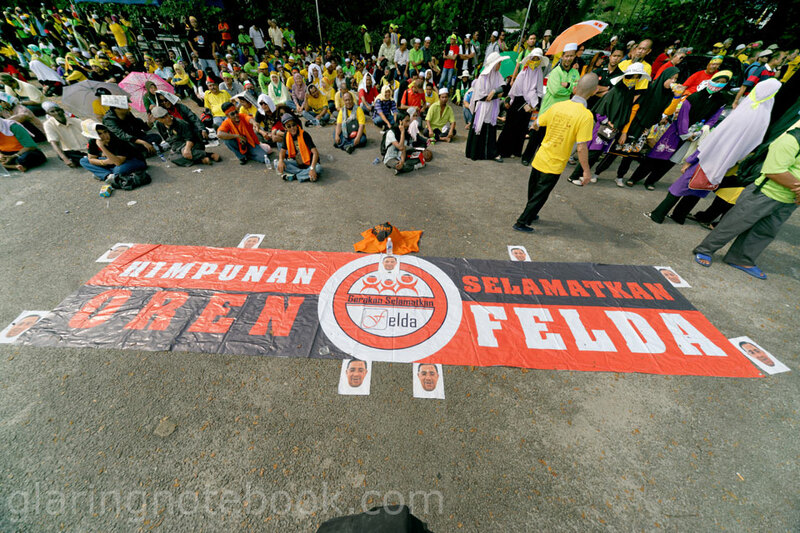 – Orange for ANAK that organized Himpunan Oren Selamatkan FELDA, a movement against political interference with FELDA, sale of palm oil to an Israeli company, that FELDA land be returned to the settlers, and against FELDA Global Ventures Holdings’ listing. – Red for Royalti, demanding the proper 20% royalty from oil harvested from the state. 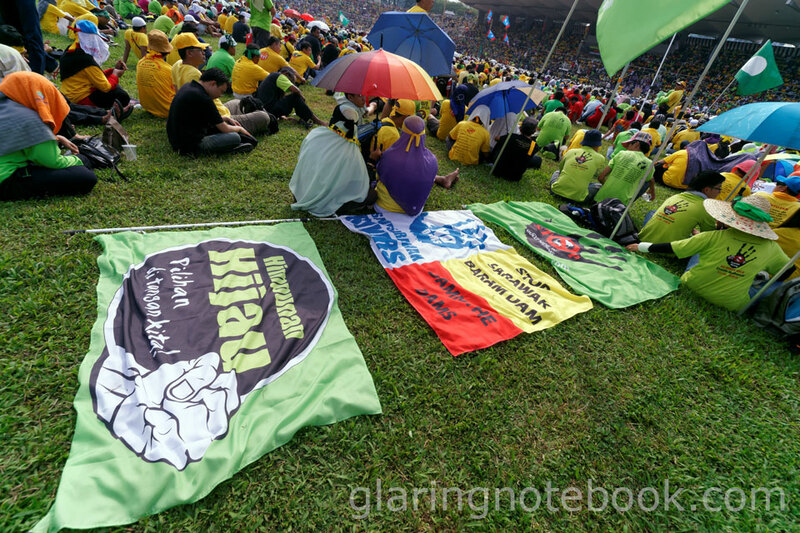 – Green for PAS, the Islamist political party. – Light blue for PKR, a centrist political party. 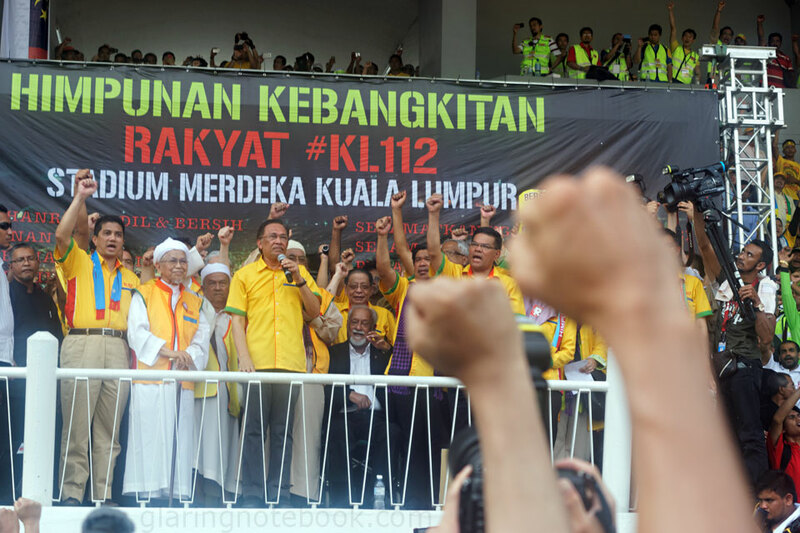 KeADILan was formed by Anwar Ibrahim’s wife, Dr. Wan Azizah Wan Ismail. 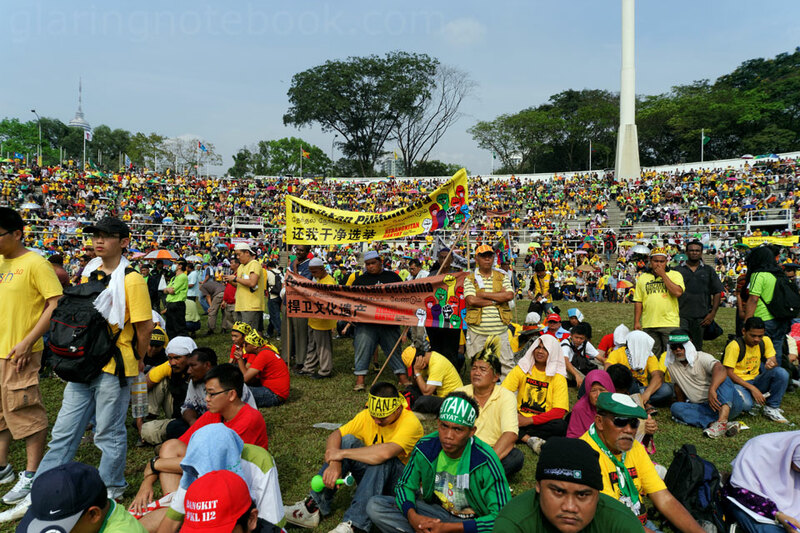 The party was born out of Anwar Ibrahim’s politically-motivated sacking and imprisonment, to reform the government. 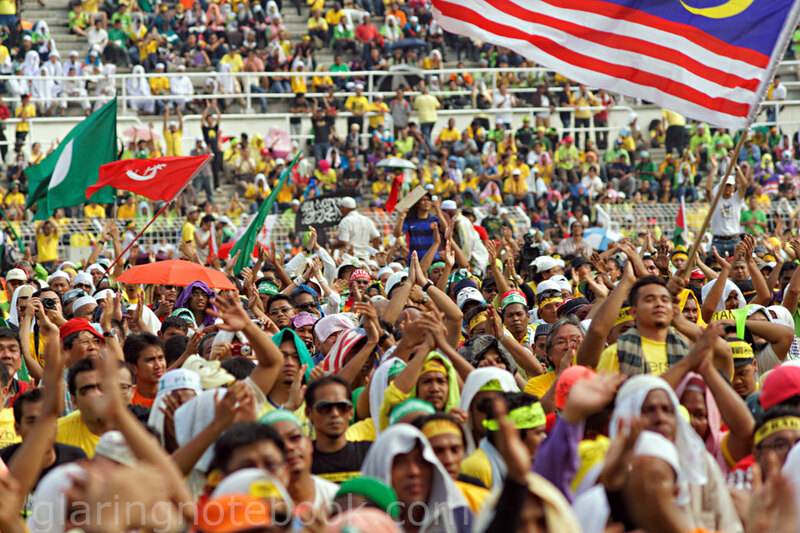 It then merged with Parti Rakyat Malaysia to form the current Parti Keadilan Rakyat. – White for DAP, a social democratic party. 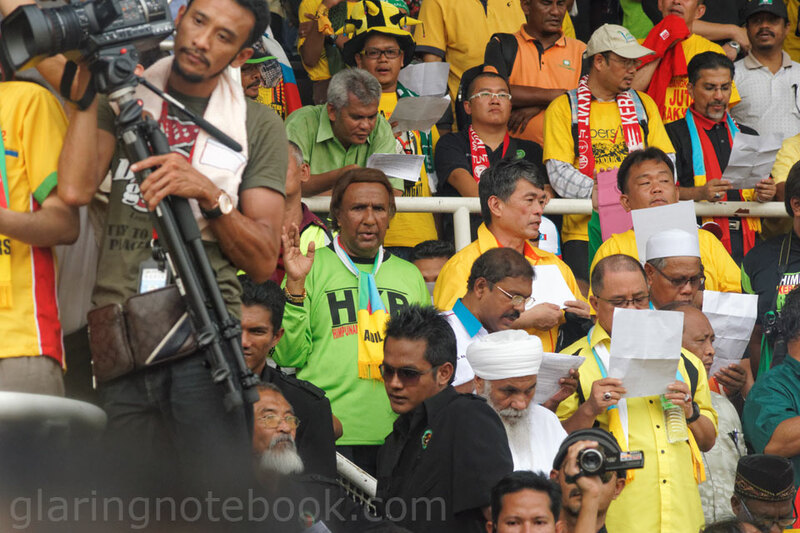 Regretfully, I did not spot Abby Abadi, formerly of Malaysian girl group ELITE, nor the purple group. I almost forgot this band, until I looked up their videos on Youtube and remembered thinking they were fine ladies with a pinch of girl power, with 90’s New Jack Swing hooks that stuck in your head without getting annoying. 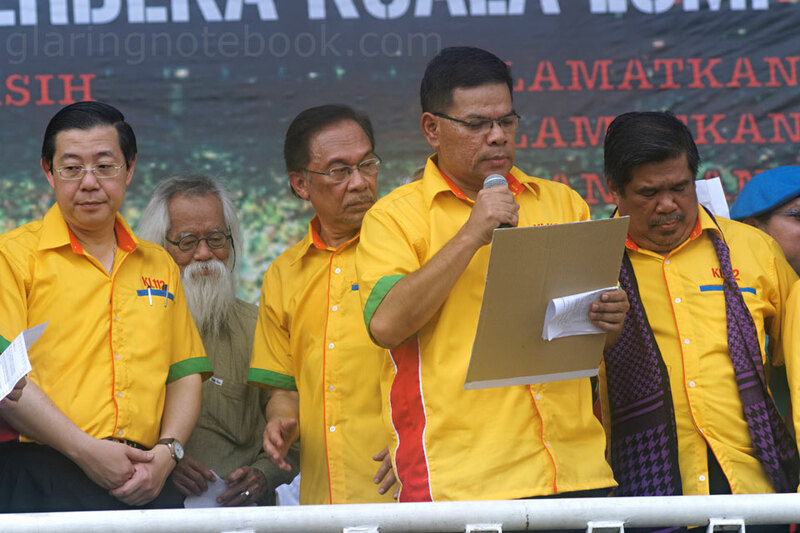 I wonder how PAS takes Abby Abadi ever since she joined the party. 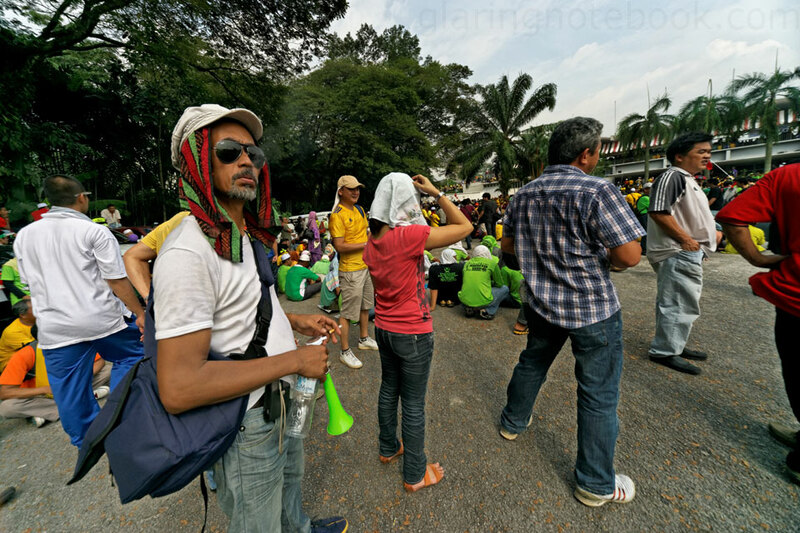 All sorts of other groups also came, like the Kumpulan Kartunis Independen, and carpet trader Deepak Jaikishan. I tried to find a full list, but there was no official one, so you could say many of these groups invited themselves. Democracy at its finest! 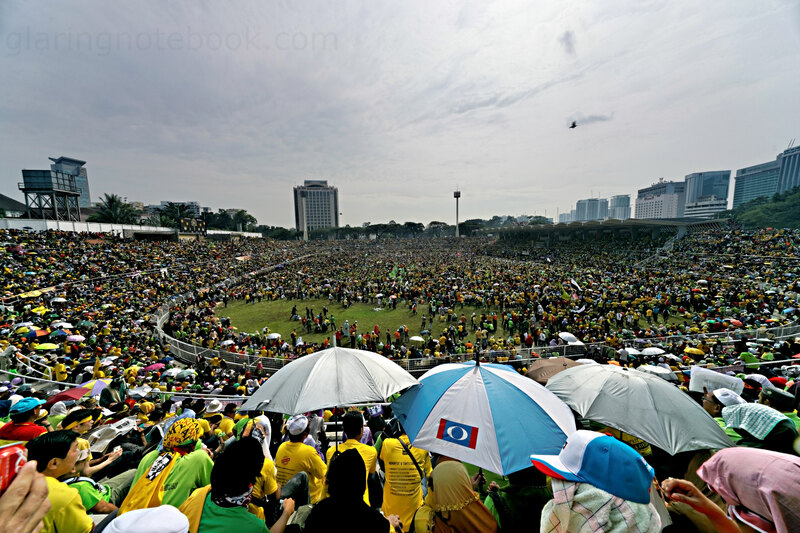 The people who consider rallies a nuisance should be thankful that this was a very general rally – anybody with a grouse could join, all on the same day! If we took the 10 fists in the above poster, and they all rallied by that day, there would be only 2 days without rallies. Let them release steam and vent their grouses – it is only healthy. Down on the field. Click the picture for the full-resolution version. Another field shot. Click the picture for the full-resolution version. 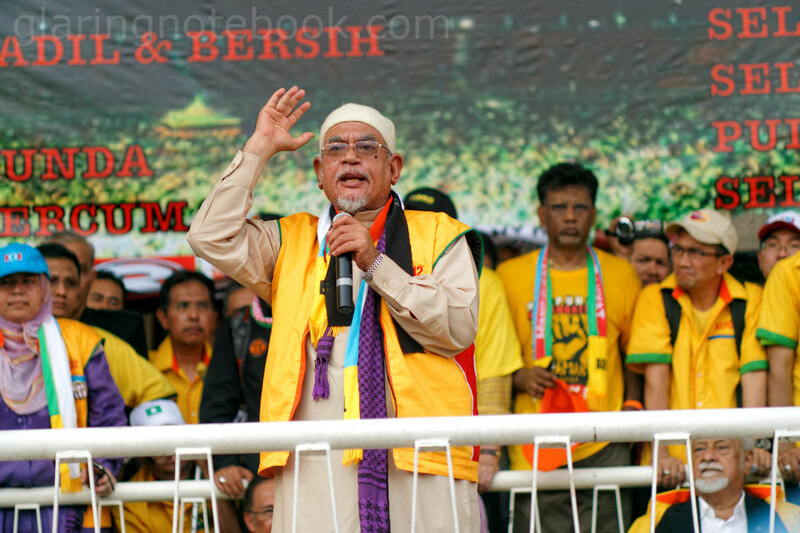 Dato’ Seri Haji Abdul Hadi bin Awang, president of PAS, gives a speech. I got to nearly in front of the stage, and this is what the crowd looked like. Click the picture for the full-resolution version. 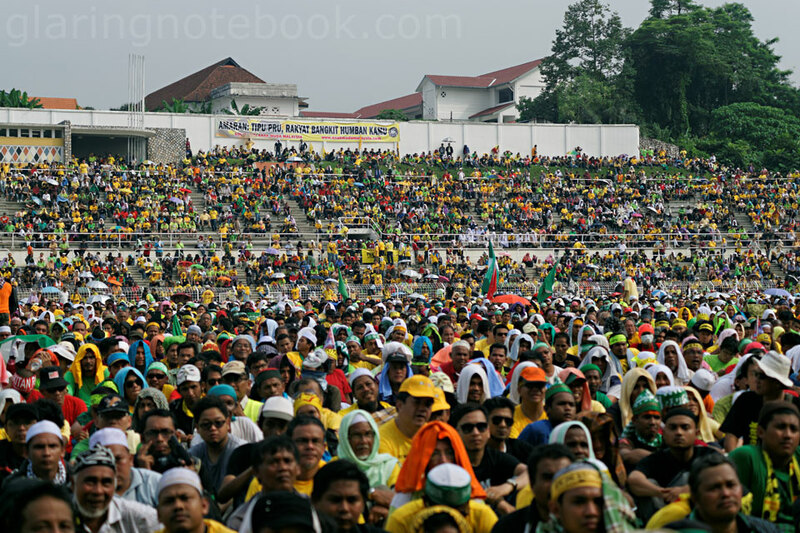 Another view of the crowd. Click the picture for the full-resolution version. 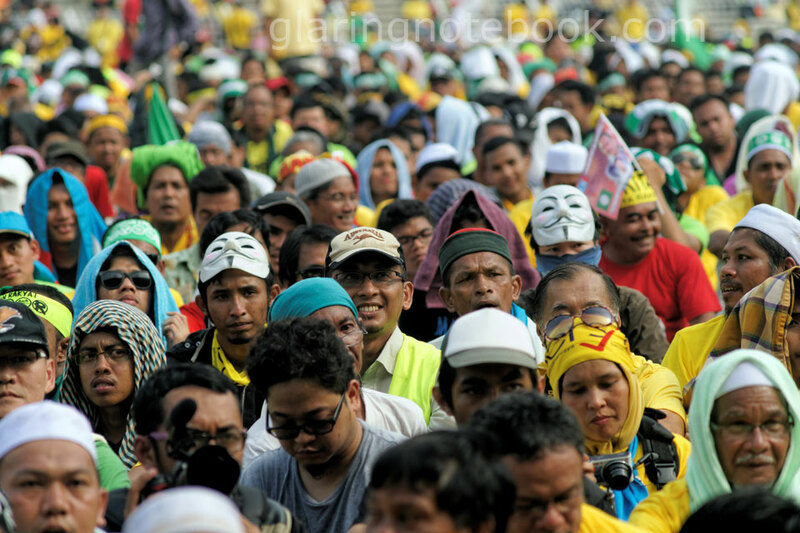 Many Guy Fawkes masks were seen around. Not sure who the Chinese guy in the middle is, but he looks familiar. Thunderous applause from the crowd. This guy in particular takes it higher! 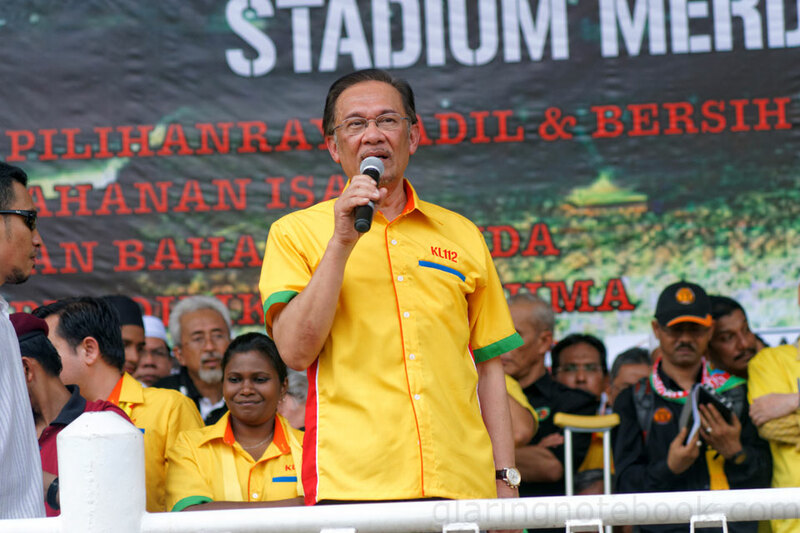 Anwar Ibrahim took the stage. 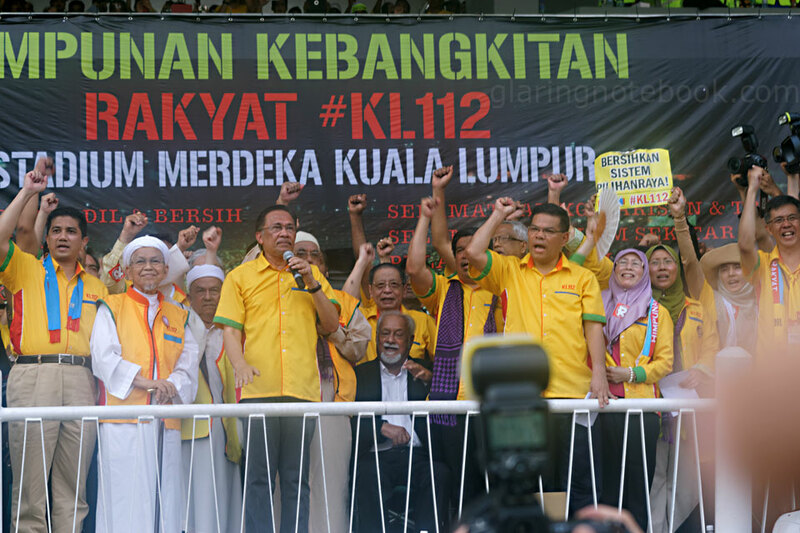 The often targeted and beleaguered Tan Sri Dato’ Seri Abdul Khalid Ibrahim, Chief Minister of Selangor, was also there. 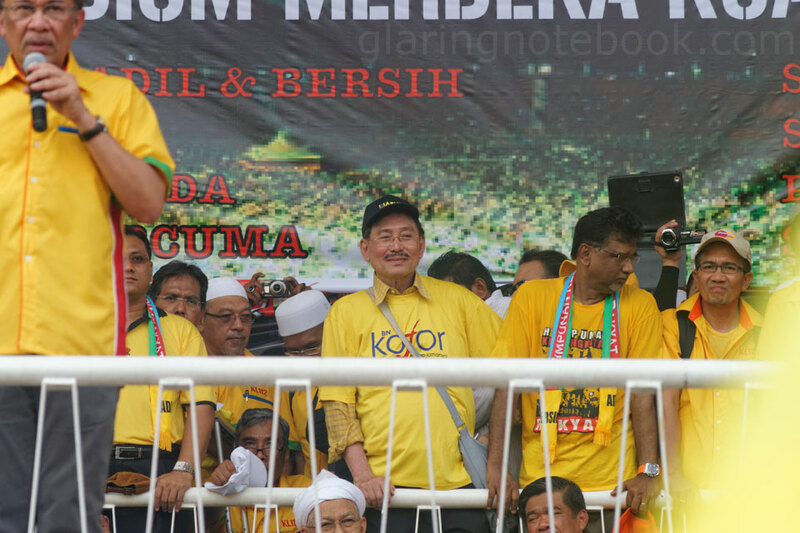 Dato’ Chua Jui Meng, with the Kotor T-shirt, formerly of MCA, formerly a Dato’ Seri (because Sultan Ibrahim Ismail revoked this title that his father, Sultan Iskandar, gave), now PKR’s Johor chief. 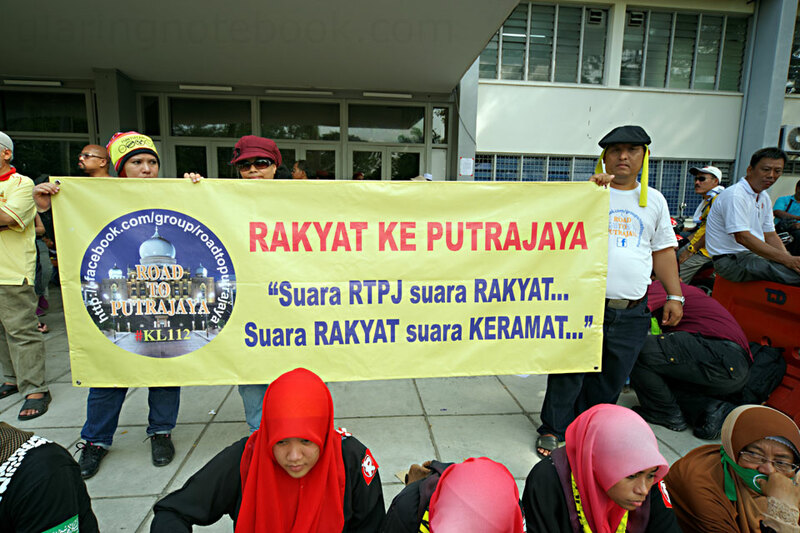 Berak Pun Kena Cukai (defecating is also taxed), says this placard in the distance, with Raja Petra Kamarudin’s face on it. 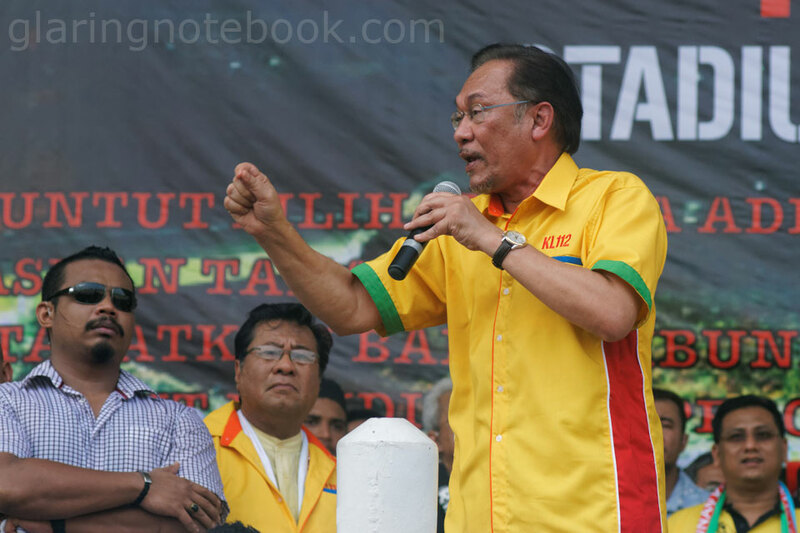 Anwar Ibrahim calls for a proper Merdeka. 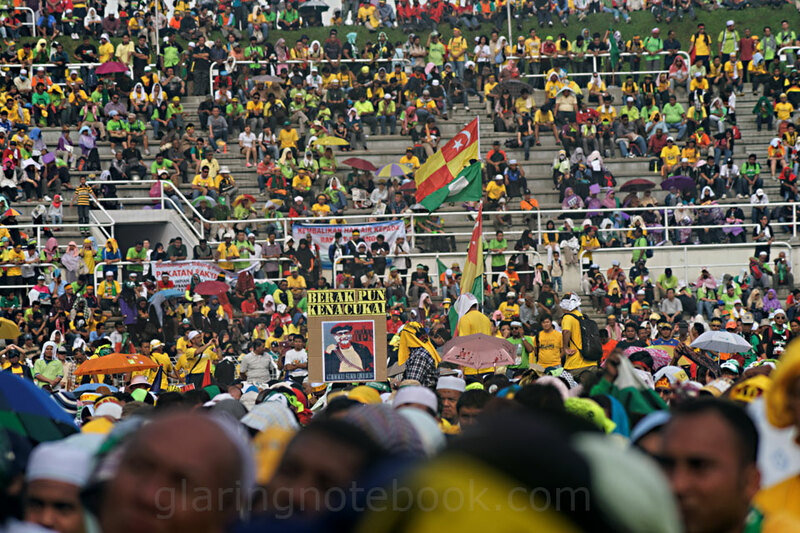 This time you can also see, from the right in yellow, Tian Chua, Nurul Izzah and Fuziah Salleh. If we all took our cameras out as proof and to be a witness, we can defeat the biased media. 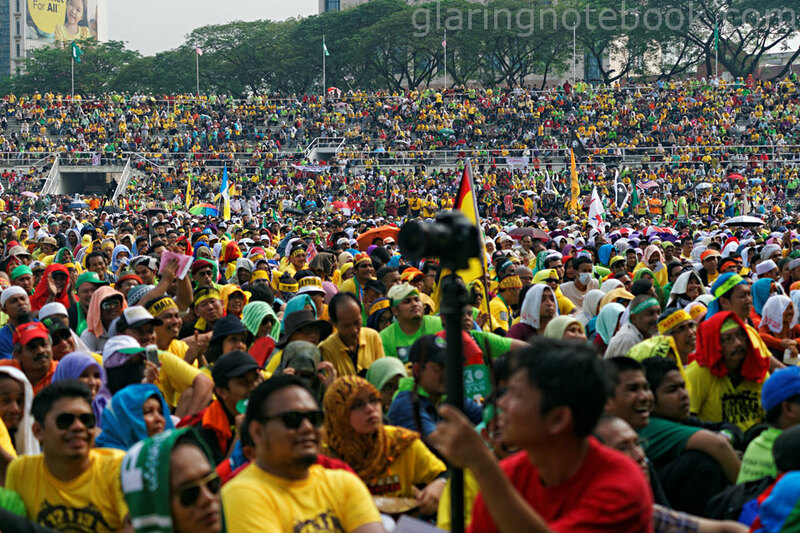 The crowd responds to Anwar’s 7 calls of Merdeka. There is something about the faces of Niz Aziz, Anwar Ibrahim, Lim Kit Siang and Karpal Singh that lead me to want to draw caricatures of them. One more with more fists. 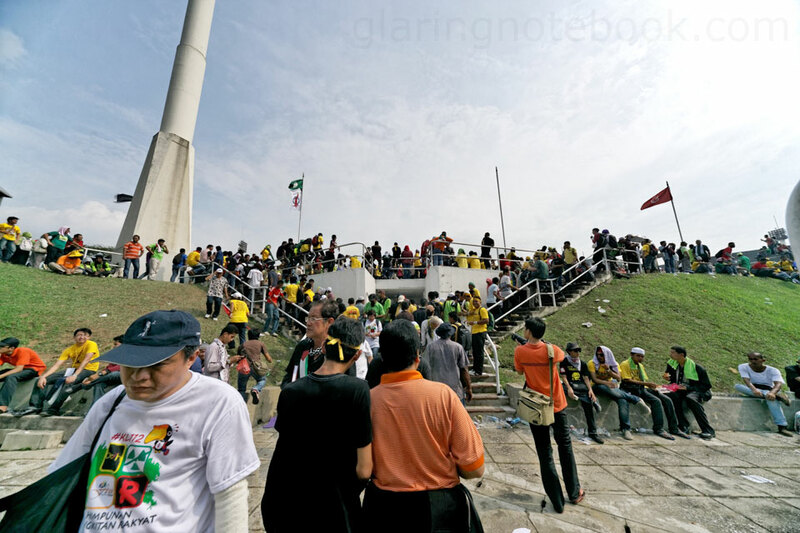 Oh and Lim Guan Eng, too, looks caricature-able. 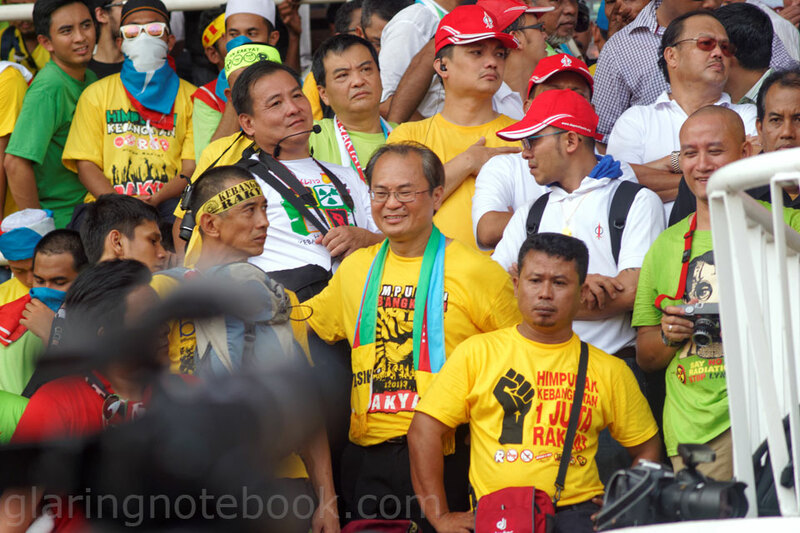 BERSIH 2.0 steering committee member Hishamudin Rais is seen in the crowd. 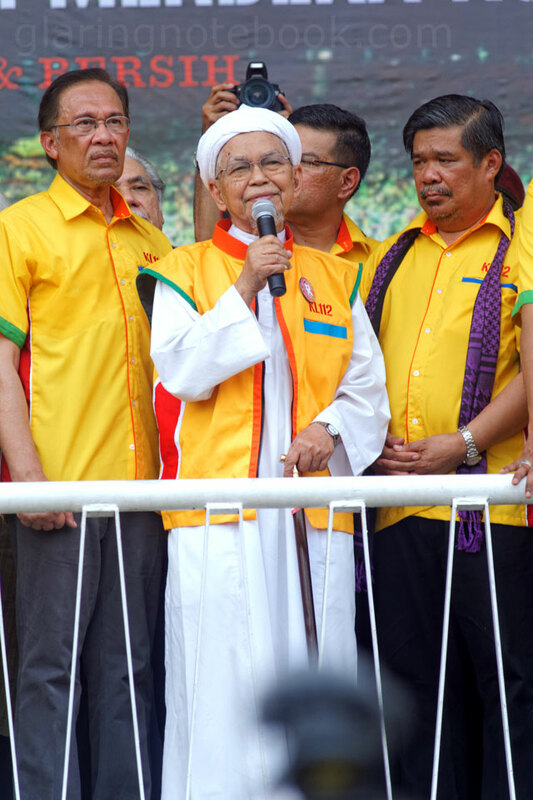 Tan Sri Abdul Kadir bin Sheikh Fadzir (formerly from UMNO, who formed his own party, IKATAN) is seen without his trademark bowtie! 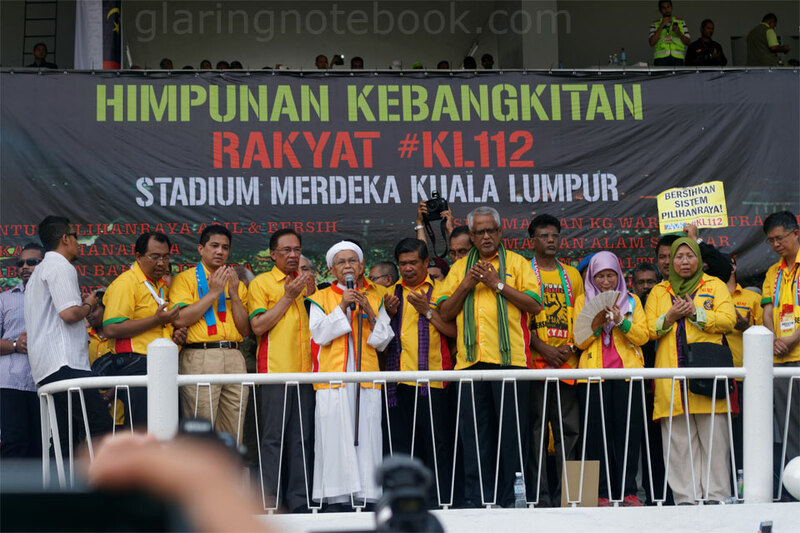 I’ve seen a picture of him at the PERKASA launch but I can’t find the blog link now. I wonder how things have changed for him! 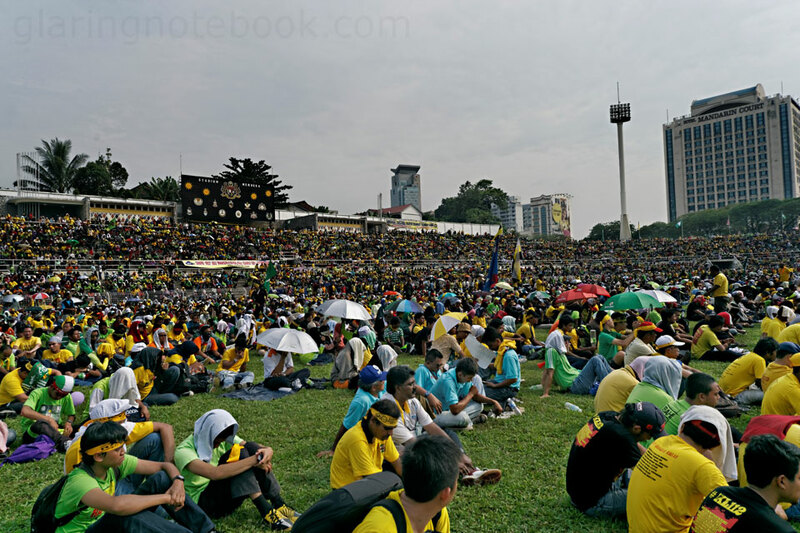 Nik Aziz gave a speech, despite sounding a bit frail. He is, after all, 82 this year. 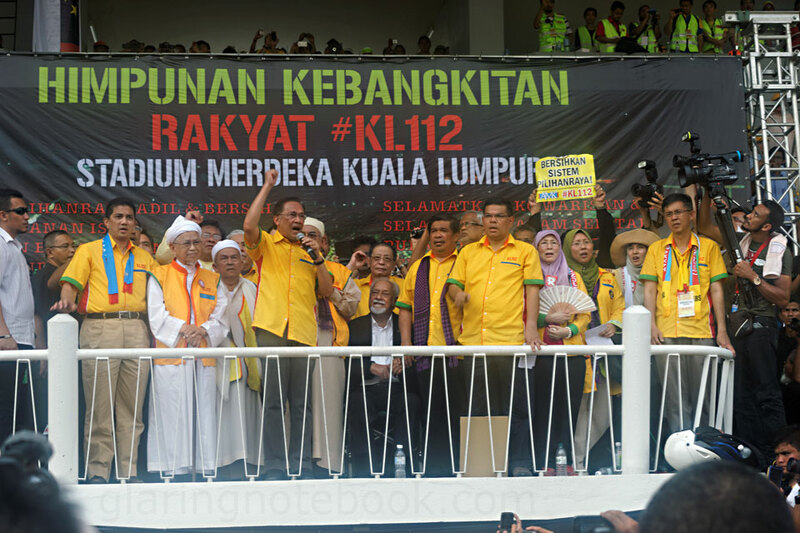 PAS secretary-general Mustapha Ali is seen peeking out from behind Anwar Ibrahim. They ended with the crowd singing the national anthem of Malaysia, Negaraku. This was hanging on a fence. The rally-goers waved goodbye to the police. Some even shook hands. It was a general sense of camaderie… and all the cops I saw had name tags. 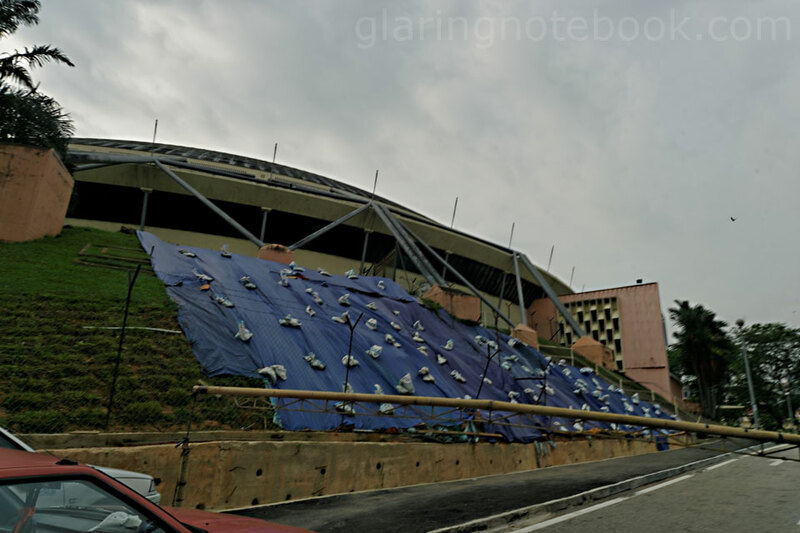 National Stadium, the other stadium that doesn’t get so much attention because it is under renovation. The MRT station that was being built next door, caused a little landslide. 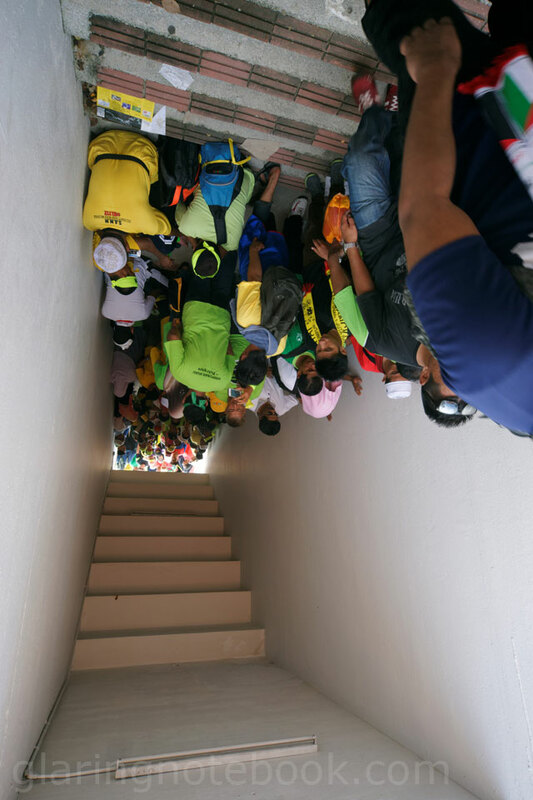 This is just one of the reasons why people are protesting against the MRT going under Jalan Sultan, that there would be risk to very old buildings. This entry was posted in Pictures, Rants on January 14, 2013 by 2konbla. Thanks man! Oh man I didn’t catch that movie, looks interesting.